The winery’s 12 acre Petite Sirah vineyard was planted in 2000 in their Burke Ranch vineyard. After fermentation is completed the wine is aged for 12 months in second use French and American oak barrels. This is another “red blend” that is a palate-pleaser when you want to try “something different”. This is a blend of 39% Zinfandel, 38% Petite Sirah and 23% Cabernet Sauvignon from vineyards in Lodi, Clarksburg and Amador. This is a blend of 80% Sauvignon Blanc and 20% Sauvignon Gris from the commune of Teuillac. The vines have an average age of 20 years. The total production was a meager 5,000 bottles. The is a blend of 60% Grenache, 20% Cinsault and 20% Syrah. Besides having “made with organic grapes” prominently on the label in a bold font, there is also an oval sticker on the lower portion of the bottle with “organic wine” featured. I guess they are attempting to catch the latest trend with some wine buyers. These are a few bottles from the past couple of months that were missed in that week’s post. Most were either an emergency replacement for an off bottle, consumed on a business trip or a bottle I was afraid may be past its’ peak. This wine is a blend of 31% Petite Sirah, 29% Petit Verdot, 27% Cabernet Sauvignon, 8% Malbec, and 5% Cabernet Franc. The bottle is closed with a screw cap. Each varietal was fermented in stainless steel tanks and aged for 14 months in a combination of American, French, Eastern European, and neutral oak barrels. There were 425 barrels of the wine produced and the final alcohol level is 13.5%. This is a blend of 80% Syrah 11% Mourvedre 9% Grenache. I’ve been a long time supporter and buyer of the wines from Vincent Arroyo. This wine is a blend of 60% Cabernet Sauvignon, 30% Malbec, 6% Petit Verdot and 4% Merlot. We have visited the Alexander Valley based Trentadue Winery a few times in the past and always had a good time and an even better tasting. This is a long time favorite wine in my house. The blend varies each vintage, this one is 49% Sangiovese, 27% Merlot, 8% Montepulciano, 8% Malbec, 7% Petite Sirah and 1% Syrah. This wine has enough acidity from the Sangiovese to stand up to dishes with tomatoes but the other grapes lend enough body and oomph to stand up to meat. We like this wine with everything from pasta with meat sauce to Veal Parmesan and baked ziti. This is a kitchen sink blend that changes every vintage. This vintage is a blend of 37% Cabernet Sauvignon, 30% Syrah, 16% Merlot, 7% Cab Franc, 3% Malbec, 3% Sangiovese, 3% Petite Verdot and 1% Carmenere from the Columbia Valley in Washington. The wine is sealed with an agglomerated cork. My eyesight may not as good as it used to be but if the alcohol percentage is on the label, I could not find it. I am a big fan of the “Flash Wine Sale” site Last Bottle. They offer one wine per day at a big discount. I highly recommend getting on their e-mail list. Like most of the flash sale sites, they offer one wine per day until it sells out. They also have a couple two-day marathons during the year. Last Bottle is a great site to buy special wines at prices low enough to open any day of the week. This wine comes from vines with an average age of 30 years planted in chalk and clay soil. The hand-picked grapes are fermented in traditional open vats and aged 10 to 12 months in French oak barrels, 35% new. The wine is a very light yellow color with a slight green tint. The fresh and appealing nose has apples, lemon zest, a spritz of grapefruit, crushed stones and white flowers. This is barely medium body with great acidity and seems to be totally dry. Tart apples, lemon zest and crushed stones greet the palate on the front end with grapefruit coming in on the backend. The long finish leaves your mouth watering for another sip. A superb bottle of wine. (92 pts) This has 13.5% alcohol and the bottle is sealed with a natural cork. For this wine, each varietal was fermented separately in upright stainless steel tanks with twice a day pump over. Each varietal is then aged for 14 months in a mix of American, French, Eastern European and neutral barrels before being blended into the final product. Randy Peters and his father-in-law, Tom Mukaida, farm this vineyard outside of Sebastopol in western Sonoma County. The southern slopes of these hills form the northern edge of the Petaluma Gap, which rushes cool, marine air from the Pacific Ocean inland. These Syrah and Viognier vines, which Randy planted for us just a few years ago, occupy less than an acre at the lowest edge of this cool, foggy vineyard. Even though Anthill Farms is more well known for their Pinot Noir wines, I love their cool-climate Syrahs. This wine is 100% destemmed Pinot Noir that was aged 11 months in used French oak. This wine has 14.25% alcohol and the bottle is sealed with a natural cork. This wine has 14.5% alcohol and the bottle is sealed with an agglomerated cork. This is a blend of 50% Zinfandel and 50% Petite Sirah from Nils Venge’s Black Rock Ranch in Lake County. The vineyard contains so much obsidian that it glows in the moonlight. Rock Wall is Kent Rosenblum’s latest project along with his daughter and a group of industry veterans. This vintage is a blend of 33% Petite Sirah, 31% Cabernet Sauvignon, 29% Petit Verdot, 4% Malbec and 3% Merlot. This has 13.5% alcohol and the bottle is sealed with a screw cap. This has 14.0% alcohol by volume and the bottle was sealed with a natural cork. About the only part of the cork that was not stained and saturated was the edge. This is based on samples supplied by the winery or another organization on their behalf. I tried the previous vintage of these wines and enjoyed them, I’m looking forward to trying the new vintages. 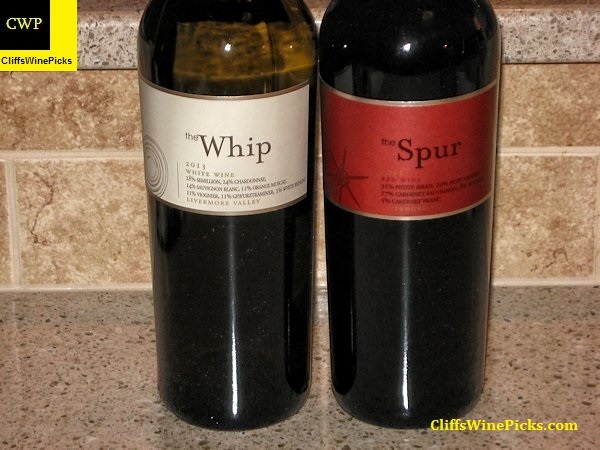 These are both blends that will be different from most of your everyday wines. Sometimes thinking (or drinking) outside the box can be a rewarding experience. Murrieta’s Well was named after the legendary bandito Joaquin Murrieta. Joaquin roamed California during the Gold Rush era rounding up wild cattle and horses. He would then “drive” them down to Mexico to sell to the Mexican Army. The bubbling artesian well on the site that now is the winery was one of his popular watering spots on his journeys. More information on this historical location is available on the Historical Marker database. With a deeply rooted history, unsurpassed terroir and rich winemaking heritage, Murrieta’s Well is one of California’s original treasures. The 92-acre Estate was originally propagated by Louis Mel in 1883 with vineyard cuttings from Chateau d’Yquem and Chateau Margaux. During the same era, he built a gravity-flow winery into the hillside adjacent to the property’s artesian well. In 1990, Philip Wente and Sergio Traverso realized a lifelong dream to revive the historic property, and since then, the two have been crafting Estate blends that highlight the best attributes of the terroir. Murrieta’s Well is part of Wente Family Estates along with Wente Vineyards and Tamás Estates. The winery produces approximately 12,000 cases a vintage. Much more of the winery’s history and additional information on these wines and others are available on their website. The winery also has a Wine Club with nice discounts and other benefits. Additional information is available here. These bottles were provided by Balzac Communications & Marketing. This wine is an unusual blend of 28% Semillon, 24% Chardonnay, 14% Sauvignon Blanc, 11% Orange Muscat, 11% Viognier, 11% Gewurztraminer and 1% White Riesling from California’s Livermore Valley. All the varieties were cold fermented to preserve the natural fruit character of the grapes. A small percentage of the Semillon, Sauvignon Blanc and Viognier were aged in neutral oak barrels to round out the wines and add complexity, the rest of the components were aged in stainless steel tanks. 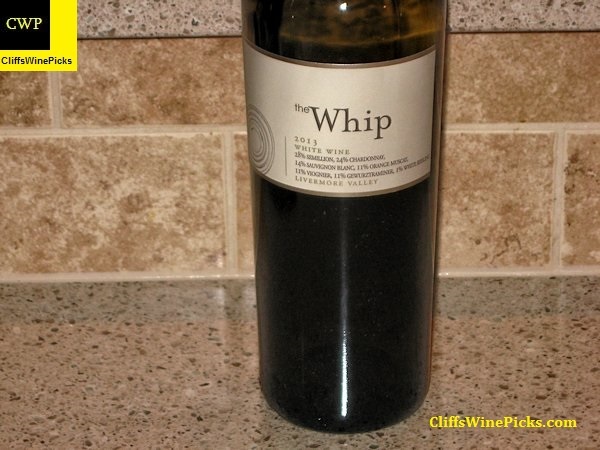 The wine has 13.0% alcohol by volume and the bottle is sealed with a twist off cap. There were 338 cases produced. This wine is a blend of 31% Petite Sirah, 29% Petit Verdot, 27% Cabernet Sauvignon, 8% Malbec, and 5% Cabernet Franc. 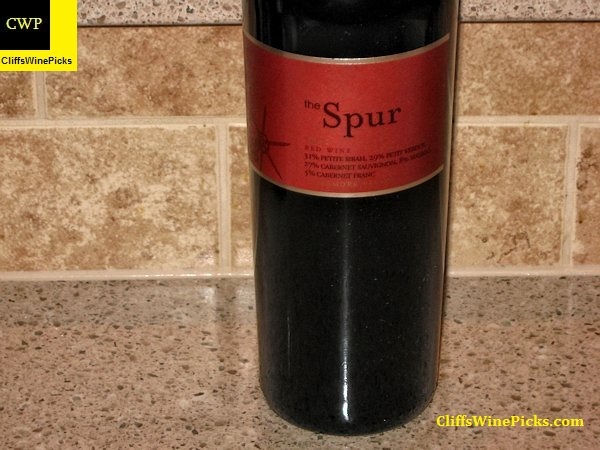 Like the Whip, the Spur is closed with a screw cap.